Move over, coffee lovers! Tea drinkers are hot on your heels. In the past ten years, sales of tea in the U.S. have exploded from $1 billion to over $5 billion. 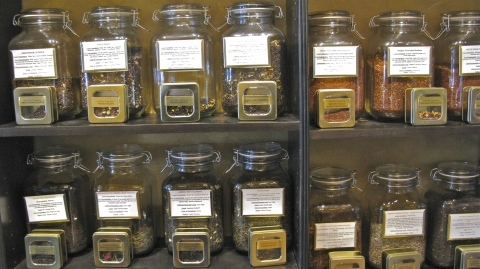 To meet this increasing demand, tea salons and tea shops have sprung up around the country. 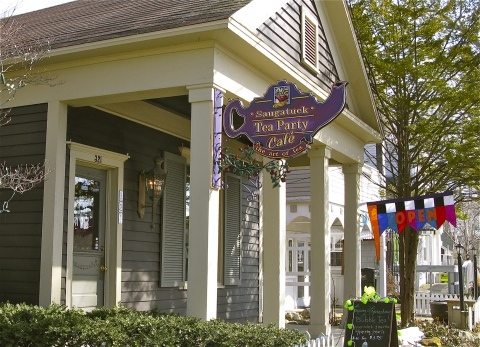 The latest of these is the charming Saugatuck Tea Cafe which opened its doors in the beautiful lakeshore village of Saugatuck on November 23, 2012. The family friendly cafe is owned and run by Gina and Christine Demos, a mother-daughter team who moved here from Chicago. 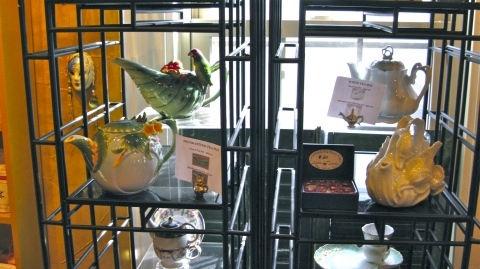 Daughter Christine says part of the inspiration for the shop came from her grandmother, who loved both tea and gardening. In fact, several of the tea blends hail from their own garden. 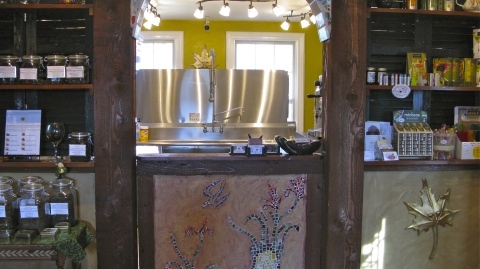 Step through the sunny cafe and explore the walls which hold over fifty artisan blend teas. These teas can be brewed to order and served hot or iced. 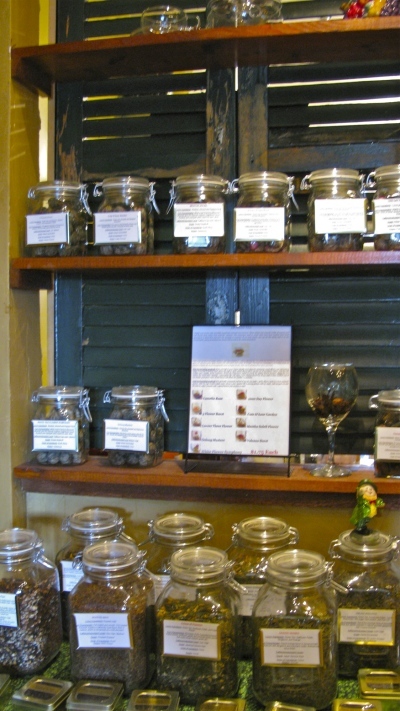 In addition, loose-leaf teas are also sold by the ounce. Don't forget to try a cup of blooming or flowering tea which is brewed from the little balls found in glass jars along the back wall. Each of these small bundles is comprised of dried tea leaves that are wrapped around dried flowers. Once steeped in hot water, this bundle unfurls, revealing the actual flower inside. All this beauty...and a delicious cup of tea besides. One of the top sellers in the cafe is bubble tea, delicious year round but especially in the hot days of summer. Long popular in Asia, bubble or Boba teas are made from fresh brewed tea, milk, ice, tapioca balls and sugar. Shaken not stirred, this refreshing chilled drink comes in a variety of pastel colors, and is crowned by a 'bubble' of foam. 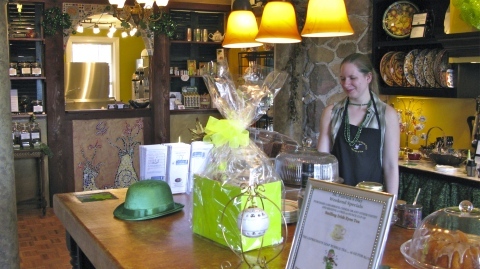 The Saugatuck Tea Cafe serves a light menu with fresh pastries provided by Holland's Posies, Plans & Pics. While seating is available inside, a number of tables will be set up outside for the summer months. And don't forget that the cafe can be booked for your own special tea party, or to celebrate a birthday, anniversary or shower. 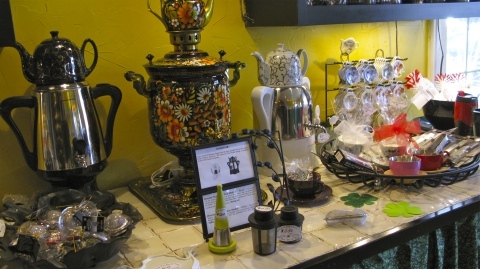 And you'll choose not only the teas you want served at the party, but which Russian samovars they will be brewed in. 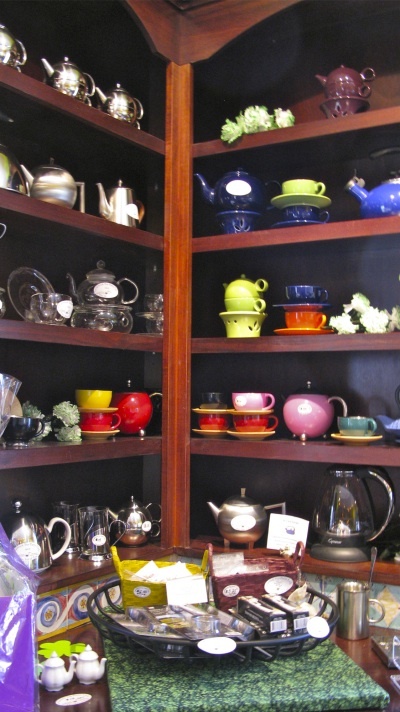 The cafe also sells everything a dedicated tea drinker needs for a perfect cup of tea including teapots, infusers, samovars, teakettles, cups, saucers and more. 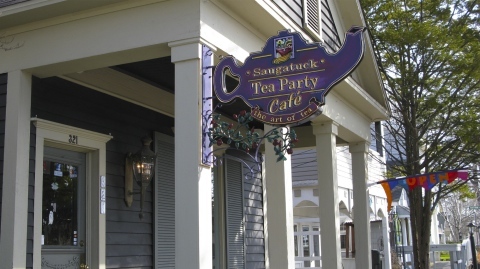 If you're looking for the perfect place to enjoy an iced Darjeeling tea, steaming cup of chamomile, a chilled bubble tea, or a mug of tea-infused hot chocolate, look no farther than the Saugatuck Tea Cafe on Water Street in downtown Saugatuck. 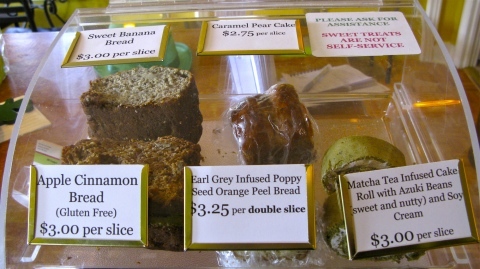 And don't forget to order a slice of Earl Grey infused poppy seed bread to go along with it. Closed on Thanksgiving Day, Christmas Day, and Easter Sunday.